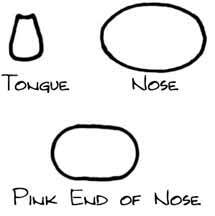 The following basic pattern is used to make either the Pig or Lion Finger Puppet or any other creature you can dream up! In the finishing directions for each puppet, we mention specific yarn and felt colors, but if you can't find those exact colors, simply use whatever yarn and felt you can find. 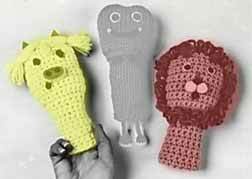 Have fun individualizing your finger puppet. There is no right or wrong color! 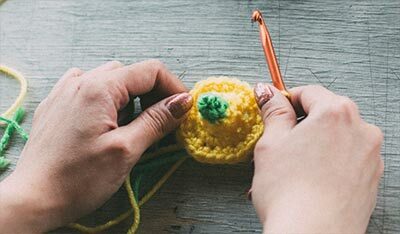 Abbreviations have not been used in these instructions in order to make it easier to read for even beginning crocheters, but the commercial abbreviations are indicated for your information. 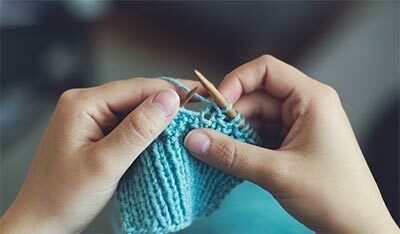 Worsted-weight yarn (this is a great project for leftover yarns since less than one ounce of yarn is needed to complete each puppet). Row 1: Work 1 single crochet into 2nd chain from hook and each chain across. There are 16 single crochet. Chain 1, turn. Row 2: Work 1 single crochet into first stitch and each stitch across. Chain 1, turn. Rows 3-18: Continue to work even in single crochet for 16 rows more. Row 19: Work 1 single crochet into first stitch, work 2 single crochet in next stitch (increase made) * work 1 single crochet in next stitch, work 2 single crochet in next stitch *, repeat between * * 6 times more. There are now 24 single crochet. Chain 1, turn. Row 20: Work 1 single crochet into first stitch and each stitch across. There are 24 single crochet. Chain 1, turn. Rows 21-33: Continue to work even in single crochet for 12 rows more. On last row, end row by cutting yarn 12" from work and pulling yarn through loop on hook. Note: For finishing directions, refer to the puppet being made. Working top of pig's head, with yarn needle and 12" tail of yarn, thread through all stitches on top. Gather top of head tightly and secure. With remaining yarn, overcast or weave seam together on back of puppet. To Make Hair: Cut 35, 4" strands of fine yellow thread. Sew them to top of puppet by tying at 3 spots across the pig's head. Glue 1" bangs in center. Cut two, 3/8" diameter white felt eyes, two, 1/4" diameter black eyes, and two, 1/8" diameter brown nostrils. Glue all felt pieces to pig's face, using the photo as a guide. Working on top of lion's head, with yarn needle and 12" tail of yarn, thread through all stitches on top. Gather top of head tightly and secure. With remaining yarn, overcast or weave seam together on back of puppet. With contrasting color and yarn needle, loop yarn around the head. Cut two, 5/8" diameter gold felt circles for ears; two, 3/8" diameter light green eyes; two, 1/4" diameter black eyes; and one, 3/8" diameter black tip of nose. Use two miniature white pom-pom balls for nostrils. Glue on all felt pieces to lion's face, using the photo as a guide.